Arrows point to tiny sacks inside neurons called synaptic vesicles, which store neurotransmitters like dopamine before they’re released from one cell to another. 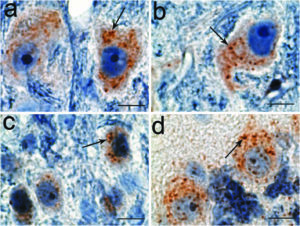 The gene TMEM230, shown in this study to cause Parkinson’s disease, encodes a protein that extends across the membrane of these synaptic vesicles. Northwestern Medicine scientists have discovered a new cause of Parkinson’s disease – mutations in a gene called TMEM230. This appears to be only the third gene definitively linked to confirmed cases of Parkinson’s disease. In a study published in Nature Genetics, the scientists provided evidence of TMEM230 mutations in patients with Parkinson’s disease from both North America and Asia. They also demonstrated that the gene is responsible for producing a protein involved in packaging the neurotransmitter dopamine in neurons. 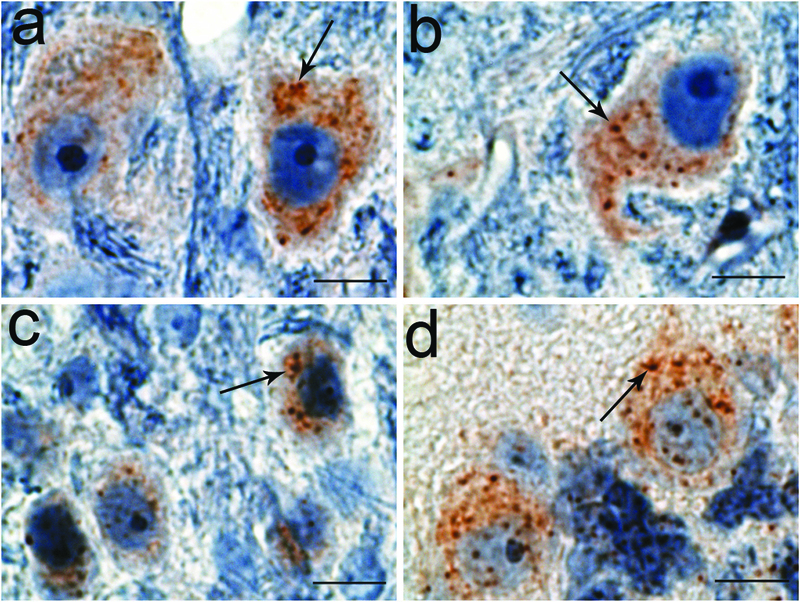 Loss of dopamine-producing neurons is a defining characteristic of Parkinson’s disease. Taken together, the study’s findings provide new clues to explain how Parkinson’s disease develops in the brain. Those clues may inform future therapies for the disorder, which currently has no cure and few known causes. About 15 percent of Parkinson’s disease cases are thought to be caused by genetics, such as mutations in two genes called SNCA and LRRK2. Siddique said that other genes have only been associated with features of parkinsonism, a general term for neurological disorders with motor symptoms. The Northwestern Medicine team’s proof that mutations in TMEM230 lead to Parkinson’s disease is the result of 20 years of research conducted with collaborators around the world. 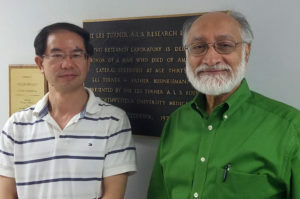 Study first author Han-Xiang Deng, MD, PhD, research professor of Neurology, and senior author Teepu Siddique, MD, Les Turner ALS Foundation/Herbert C. Wenske Foundation Professor of Neurology and of Cell and Molecular Biology. The project began in 1996, when Siddique and study first author Han-Xiang Deng, MD, PhD, research professor of Neurology, began investigating a family with 15 members who had typical symptoms of Parkinson’s disease. Using DNA samples provided by co-author Ali Rajput, MBBS, from the University of Saskatchewan, Siddique and Deng performed genome-wide analysis on 65 of the family’s members, including 13 with the disease, in hopes of finding a common mutation that could explain the prevalence. They were able to narrow the search down to a small region of DNA on chromosome 20 that contained 141 known genes. Using whole exome sequencing technology, they then compared DNA variations – genetic differences – in one healthy family member to those in four family members with the disease. The scientists found more than 90,000 variants before eventually identifying TMEM230 as the gene with disease-causing mutation. The scientists discovered that TMEM230 encodes a protein that extends across the membrane of tiny sacks inside neurons called synaptic vesicles, which store neurotransmitters before they’re released from one cell to another. “Current symptomatic treatments for Parkinson’s disease increase the neurotransmitter dopamine that is released by these synaptic vesicles to cells that project into different parts of the brain controlling motor activity, mood and many other organ systems affected by the disease,” Siddique said. The scientists hypothesize that the protein is involved in the movement of these vesicles. Importantly, the research team also found mutations in the TMEM230 gene in cases of Parkinson’s disease in additional families in North America and as far away as China. They verified that these patients had both clinical characteristics of the disease (symptoms like tremors, slow movement and stiffness) as well as pathological evidence in the brain (loss of dopamine neurons and abnormal accumulations of proteins inside surviving neurons). 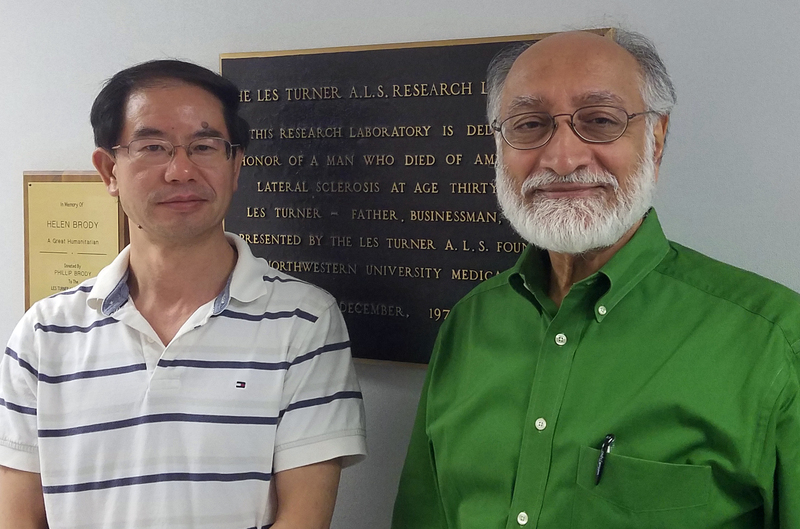 In future research, Siddique and Deng plan to explore how TMEM230 mutations cause disease using mouse models. Additional Northwestern study authors include Yong Shi, MD, PhD, Yi Yang, Kreshnik Ahmeti, Nimrod Miller, PhD, Lijun Cheng, PhD, Hong Zhai, Sheng Deng, PhD, Myung Jong Kim, PhD, research assistant professor of Neurology, Ziquang Yang, Faisal Fecto, MD, PhD, Nailah Siddique, Dimitri Krainc, MD, chair of Neurology, Onur Melen, MD, ’73, ’75 GME, assistant professor of Neurology and Ophthalmology, and Yong-Chao Ma, PhD, assistant professor of Pediatrics, Neurology and Physiology. This study was supported by the American Parkinson’s Disease Association; the National Institutes of Health grants NS074366, NS37167, NS078287, NS094564, AG043970, AG10133 and NS095972; National Natural Science Foundation of China grants 81271921, 81430023 and 81471300; the Les Turner Foundation/the Herbert C. Wenske Foundation Professorship; the Les Turner ALS Foundation; the George Link, Jr. Foundation; and The Foglia Family Foundation.